Orchids at Palm Court is in the middle of a transition. 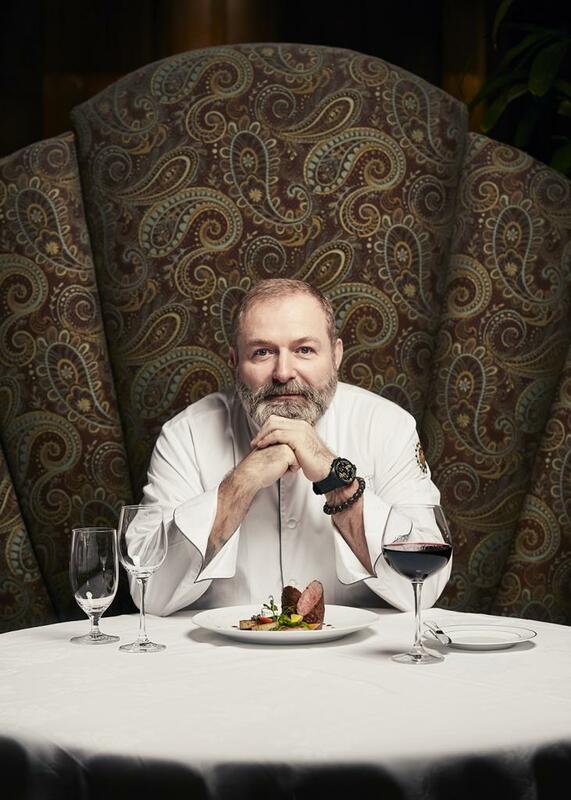 Chef Todd Kelly, who had been at the helm for 11 years and made the restaurant one of the city’s best, recently left for Atlanta’s Cherokee Town and Country Club. 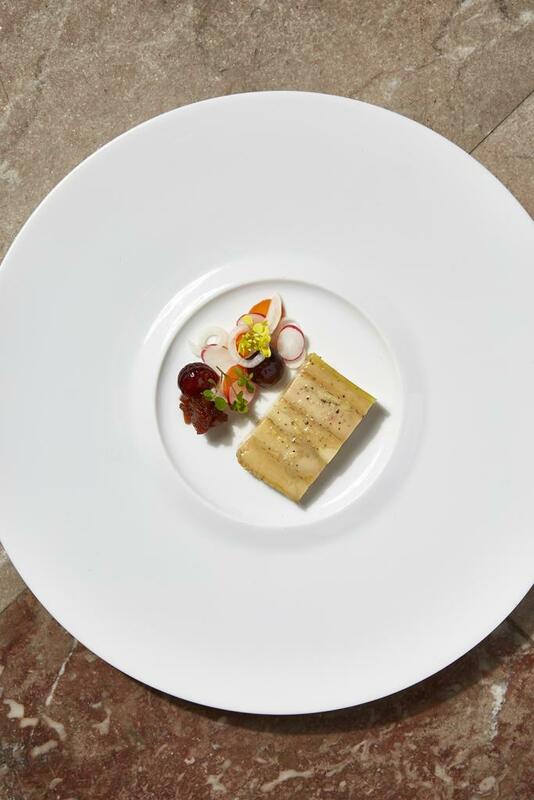 His replacement, Chef Maxime Kien, was of course cooking his own food, but initially, several elements of the dining experience remained from the Kelly era—the tasting-menu format, for example, with three-, four-, and five-course options, with diners making selections for each course; and even the boxed granola bar at the end of the meal. The swellegant Orchids dining room. It took about two months for Kien to put his own signature on the restaurant. All of those conventions are now gone—except for the granola bar, which, with a nut base and a hint of cardamom, has actually gotten a little better. The restaurant, Kien said, had hired him to look forward, so nothing was going to stay simply for continuity’s sake. His new menu and format feature an à la carte menu on one page, and on the other, a prix fixe tasting menu that will change, not seasonally as in former iterations of the restaurant, but daily, based on ingredients, freshness, and inspiration. With this menu, there are no options within the courses, just what the kitchen wants to give you. You need to trust a chef to invest in this kind of an experience. Luckily, from my few meals there, I have rarely felt more confident in a restaurant’s ability to deliver on its promises. Orchids is only just starting to run according to Kien’s vision, and he is already putting out some of the most exciting and consistent food in the city. 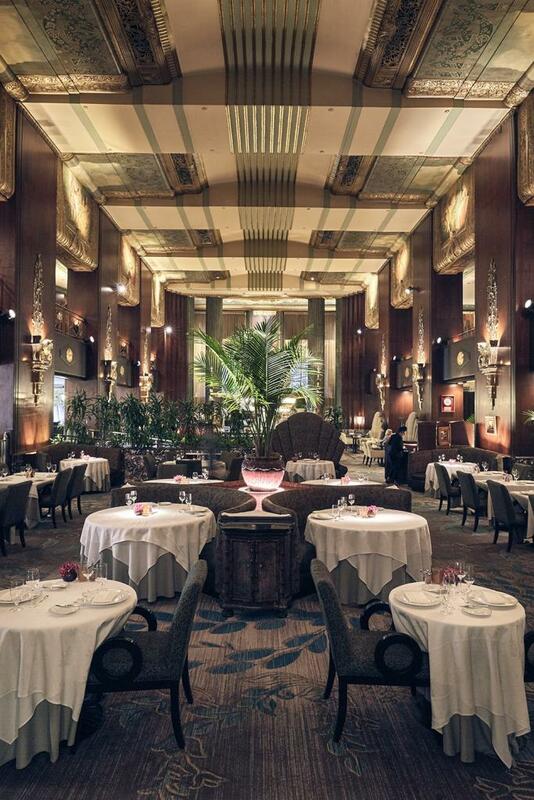 Yes, it is extremely expensive—but from the experience of sitting in the dining room and looking at the paintings on the walls to listening to the jazz band, you will get something special for your money. Kelly made Orchids a local institution during his tenure—it is, as is mentioned everywhere, the only restaurant in Ohio to earn a five-diamond rating from AAA. Some differences in approach are already apparent early in Kien’s tenure. Kelly had a kind of wit in his cooking; there were feats of technique, from the mozzarella balloons to the wrapping of fish in a puff pastry papillote. With Kien, the dishes are clearly haute cuisine, but the sense of playfulness is much less prominent. Kelly’s dishes also worked on a somewhat muted register; there was a blended, impressionistic quality to the flavors, created through a staggering number of elements. Kien’s approach, instead, has a certain thrust to it—the springs of raw fringed French lavender around the pork cheeks bring a forcefulness that marks a very different sensibility. Kien grew up in Côte d’Azur, on the French Riviera, close to the Italian border, and some of the intensity and clarity in his cooking seems to come from this Mediterranean heritage. He talks about being mere minutes from both the sea, where you could get fresh fish, and the mountains, full of meat and mushrooms, and his focus is always on letting the ingredients shine. 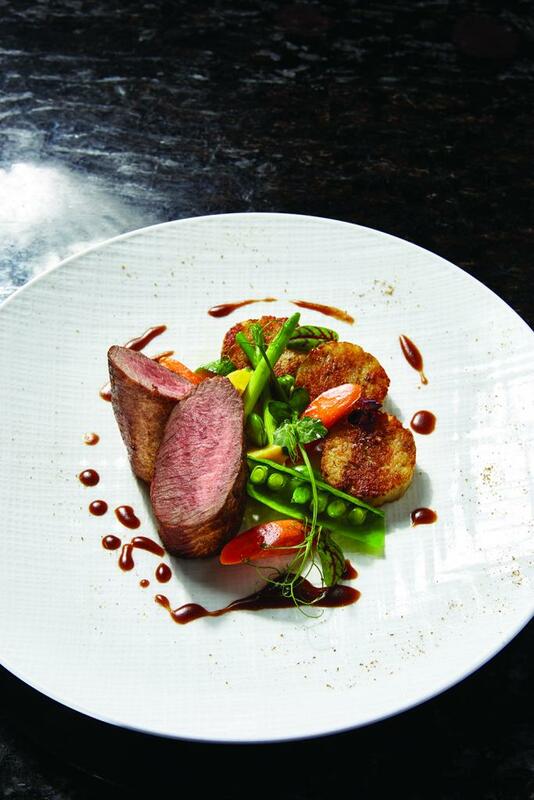 Lamb loin with spring vegetables and macaire potatoes. One of my favorite dishes of the evening—the smoked sturgeon chaud-froid—is an example of how a classic concept (inspired by the jellied layer that often settles above cooked meats when they are cooled) can retain its essential character while gaining elegance and complexity. Each layer—the creamy sturgeon, a tomato gelée, and a cauliflower tapenade—adds a new dimension, and the dish keeps evolving with each bite, from a hint of anise to a dusting of pepper, without ever losing the center smokiness of the sturgeon. Reflecting the new vigor of the flavors, the wine pairings have taken on a lusciousness and almost tropical quality that would have been out of place with Kelly’s food, but suits Kien’s style perfectly—from an intensely grapefruit-rind flavored Greywacke sauvignon blanc from New Zealand that accompanies the winter garden dish with creamy sous vide vegetables to a Famille Hugel Gewurztraminer with notes of lychee that cut through the mustard and subtle horseradish flavors of the beet salad. All of this is part of the new élan of Orchids—some of the focus has shifted from wowing you with feats of craft to developing deep flavor and highlighting the natural taste of ingredients, from a Jerusalem artichoke terrine that kept its lovely water-chestnut-like flavor to a dazzling array of simply but lovingly prepared mushrooms. 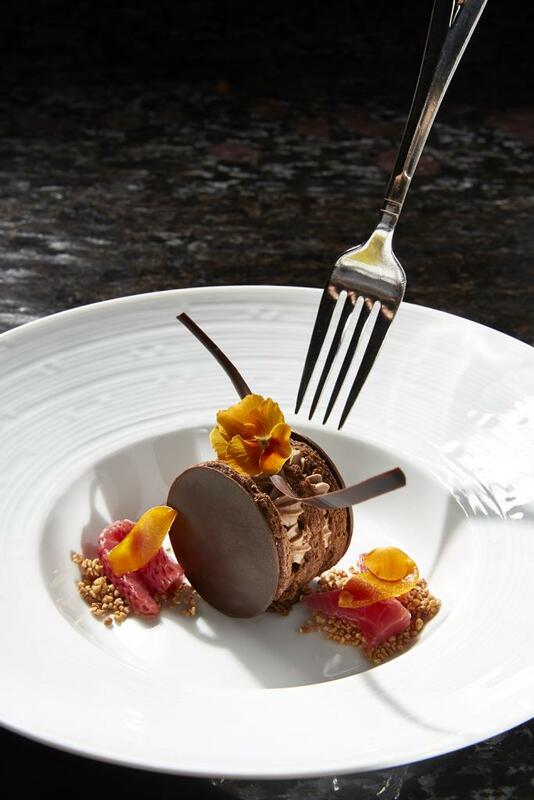 Pastry chef Megan Ketover left for Boca in May, but Claire Mongenas, who worked under Ketover, is now at the helm, and clearly deserves to be there. I need to mention her strawberry pistachio custard, because it is in the running for the best dessert I have ever eaten. Words can’t do justice to how good this thing is: a circle of strawberry custard, a lemony fromage blanc ice cream over granola, tiny cylinders of pistachio cakes, white chocolate medallions hand-painted with strawberry cross—each bite is a miracle of freshness and balance. If I were a strawberry, I would consider it the crowning achievement of my life to end up in a dish like this. Chocolate velvet cake with Kentucky bourbon mousse. The disappointments are never bad, just good in an ordinary way, and I mention them only because Orchids strikes me as being genuinely interested in perfection. The amuse-bouches, for example, didn’t add much to the meal for me. The sauce on the pork cheek, when mixed with a carrot puree, was slightly syrupy and oversweet. A foie gras with crispy bread crumbs, Concord grape, and black sesame paste had a similar sense of being slightly excessive; it reminded me a bit of a peanut-butter-and-jelly sandwich, and I have already had too many of those in my life. (Frankly, with so many delicious things in the world, I am not sure why we need to torment ducks for this particular product.) Service is generally impeccable, but when my wife ordered the oxtail raviolo, they accidentally poured in the wrong broth—the oyster mushroom (which belonged with the scallops) instead of the bone broth consommé. They caught the mistake before she even ate a bite, but were so eager to correct the issue that they brought a replacement that wasn’t quite up to temperature. So a certain over-eagerness to please made the dish less than it might have been. All of these details may disappear once Kien has the menu and his take on it more firmly in hand. Hudson Valley Foie Gras terrine with pickled vegetables and onion marmalade. For the most part, though, my meals were filled with wonder after wonder, on par with the best Cincinnati has to offer. As Dumaine said of his own food, “There are no tricks, no attempts to disguise the true taste by overuse of wine or condiments. What it requires is patience. One must avoid the temptation to hurry, to use substitutes.” There are no substitutes at Orchids, and there are really no substitutes for Orchids—it is one of the city’s indispensable restaurants. That five-star rating is not going anywhere. Not quite the best restaurant in the city yet, but close (and likely to get closer). Previous articleAre You Ready for the Second Biennial Cincinnati Neighborhood Games?